Eleven-year-old Isabella’s blended family is more divided than ever in this thoughtful story about divorce and racial identity from the award-winning and New York Times bestselling author of Out of My Mind, Sharon M. Draper. Eleven-year-old Isabella’s parents are divorced, so she has to switch lives every week: One week she’s Isabella with her dad, his girlfriend Anastasia, and her son Darren living in a fancy house where they are one of the only black families in the neighborhood. The next week she’s Izzy with her mom and her boyfriend John-Mark in a small, not-so-fancy house that she loves. Because of this, Isabella has always felt pulled between two worlds. And now that her parents are divorced, it seems their fights are even worse, and they’re always about HER. Isabella feels even more stuck in the middle, split and divided between them than ever. And she’s is beginning to realize that being split between Mom and Dad is more than switching houses, switching nicknames, switching backpacks: it’s also about switching identities. Her dad is black, her mom is white, and strangers are always commenting: “You’re so exotic!” “You look so unusual.” “But what are you really?” She knows what they’re really saying: “You don’t look like your parents.” “You’re different.” “What race are you really?” And when her parents, who both get engaged at the same time, get in their biggest fight ever, Isabella doesn’t just feel divided, she feels ripped in two. What does it mean to be half white or half black? To belong to half mom and half dad? And if you’re only seen as half of this and half of that, how can you ever feel whole? It seems like nothing can bring Isabella’s family together again—until the worst happens. Isabella and Darren are stopped by the police. A cell phone is mistaken for a gun. And shots are fired. 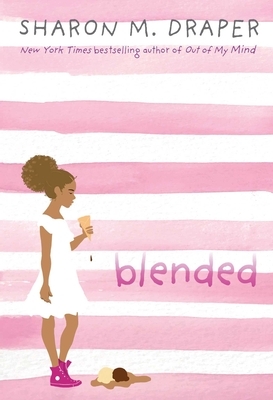 "Blended is a graceful novel about family and identity that will enlighten and entertain readers. Draper's insight into the world of an 11-year-old girl is uncanny." Draper has written a book in which kids will see themselves. Draper writes with grace, compassion, and respect for the intelligence and emotional lives of young readers.... This is Draper at her best, penning a current and ultimately uplifting story. Isabella's genuine 11-year-old voice captures events rarely seen in middle-grade fiction but too often seen by actual middle graders.